Even though I’d usually eat a bar of dark, rather than white chocolate, in baked goods and desserts I definitely prefer the taste of the white one. White chocolate pairs especially well with different berries; the lightly tart flavor of the fruit balances its sweetness and makes the chocolate less bland. I used wild blueberries here, but regular blueberries will do as well. 3. Crush the biscuits in a food processor. Mix with melted butter and press into prepared pan. Bake for 8 minutes. Set aside. 5. Split the vanilla bean lengthways, scrape out the seeds. Mix with the cheese. Set aside. 7. Using an electric mixer, beat the cheese until very smooth. Add the sugar and salt and beat until well combined. 8. Beat in eggs, adding one at a time and scraping the sides as needed until the mixture is smooth. 9. Mix in white chocolate. Fold in blueberries. 10. Spoon the cheese mixture onto the prepared crust. Bake on the bottom rack of oven for 15 minutes. Reduce oven temperature to 210 F (100 °C) and continue to bake for 1 hour. When done, the cheesecake should be mostly solid around the edges but still jiggle a little in the center when you shake the pan. 11. Immediately run a thin knife around the edge of the cake. 12. Cool the cake in the oven with the door ajar for 1 hour. 13. Remove from oven and chill overnight in the fridge. * The original recipe uses graham cracker crumbs for the crust, and cream cheese and vanilla extract in the filling. Well I just baked this and it got rather brown on the top. I only baked the the first part at 450 for 12 min then I turned it down to 200 and only baked it 25 min and it is baked for sure. And like I said brown on the top. 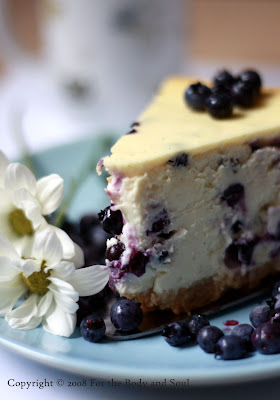 I have baked many cheesecakes before so I just wanted to make this note. I will let you know after we eat it how it tastes. 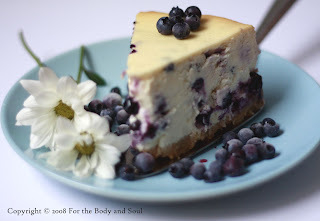 This is the third time I've made this cheesecake, and I have to say "it's one of my favorites! "....only thing I do differently is, instead of one cup melted chocolate to the cheesecake mixture, I only use 1/2 cup. Then with the other cup, I pour on top cheesecake........divine!